White baseball pants can be a challenge to clean, as stains from playing hard stand out against the white fabric. Because baseball is played in a variety of outdoor conditions, ground-in dirt and grass stains are unavoidable. When stains are not properly treated on white baseball pants, even clean pants will look dirty and unsightly. Using the correct stain treatment and laundry techniques can help keep the pants looking clean all season long. Remove any loose dirt or excess mud. 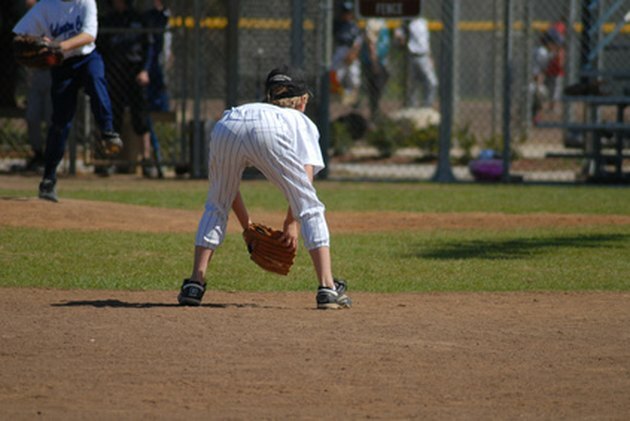 Dry baseball pants should be shaken vigorously or gently brushed to remove dirt particles. Wet pants should be hosed off with cold water outdoors, or sprayed with cold water in a utility sink to help rinse away dirt and mud. Determine if the pants are colorfast. If the pants are all white, this will not be a concern. If the pants are white with colored trim or pinstripes, care must be taken to avoid damaging the color. Mix a 1/4 cup of cold water with 1 tbsp. of chlorine bleach and place a couple of drops on an inconspicuous colored area. After two minutes, blot dry and check to see if the color has faded. If there is a color change, the pants are not colorfast and chlorine bleach should not be used. Determine the type of stain. Different stains require different treatments for optimal results. Stains from dirt, mud and blood are protein stains. Stains from red clay and grass are dye stains. Treat protein stains by first rinsing in cold water. If the stain is very fresh, cold water alone may do the trick. Never start with hot water because hot water cooks the proteins and causes them to attach deeper to the fabric. If the stain remains after rinsing in cold water, soak in cool water with an enzyme laundry additive or heavy-duty detergent. Treat dye stains caused by grass by pouring a small amount of heavy-duty laundry detergent directly on the stain and rubbing it gently into the fabric. Rinse the pants and soak in cold water with color-safe bleach. Chlorine bleach can be used for persistent stains if the pants are colorfast. Treat dye stains caused by red clay by gently rubbing the stained area with a paste of table salt and white vinegar. Leave the mixture on the stain for 30 minutes. Rinse pants in cold water after the stain has been pretreated. If the stain remains, repeat the treatment process and rinse again with cold water. Wash the pants with heavy-duty detergent in warm water. If the pants are colorfast, add chlorine bleach. If they are not colorfast, add color-safe bleach. When it comes to treating stains, time is of the essence. The sooner a stain is treated, the easier it is to remove. Avoid rubbing or scraping the stain too harshly. This can cause damage to the fibers in the fabric, leading to pulls or holes in the pants.